The Miranda warning is part of a preventive criminal procedure rule that law enforcement are required to administer to protect an individual who is in custody and subject to direct questioning or its functional equivalent from a violation of their Fifth Amendment right against compelled self-incrimination. 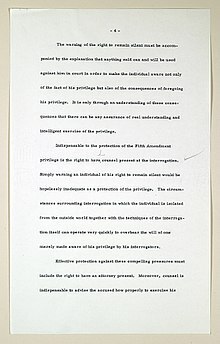 In Miranda v. Arizona (1966), the Supreme Court held that the admission of an elicited incriminating statement by a suspect not informed of these rights violates the Fifth Amendment and the Sixth Amendment right to counsel, through the incorporation of these rights into state law. [Note 1] Thus, if law enforcement officials decline to offer a Miranda warning to an individual in their custody, they may interrogate that person and act upon the knowledge gained, but may not use that person's statements as evidence against them in a criminal trial.